NEW! 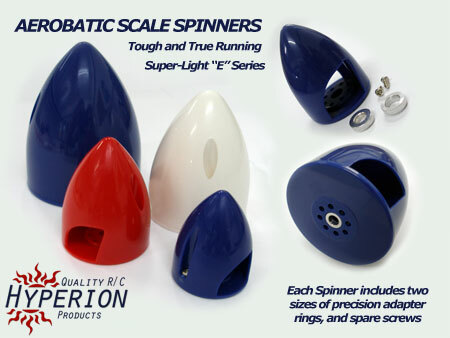 Hyperion Hi-Scale Aerobatic Spinners. Very light and true-running; made of tough ABS plastic in a beautiful gloss finish. Available in RED. WHITE, and BLUE to match standard covering colors. Each spinner comes with two precision adapter rings to fit two sizes of collet adapters. This product was added to our catalog on Sunday 18 March, 2007.